This year’s student film showcase had it all; from jaw-dropping cinematography to Christian worldviews, the films presented gave the audience a sense of beauty and depth. If you ask a random person on campus their major, it’s a good chance they’re Cinema-Television. Regent is known for having a large film program. While many students struggle to finish papers and study for exams, film students stay up late, spending hours on sets or editing films for Regent’s Student Film Showcase. 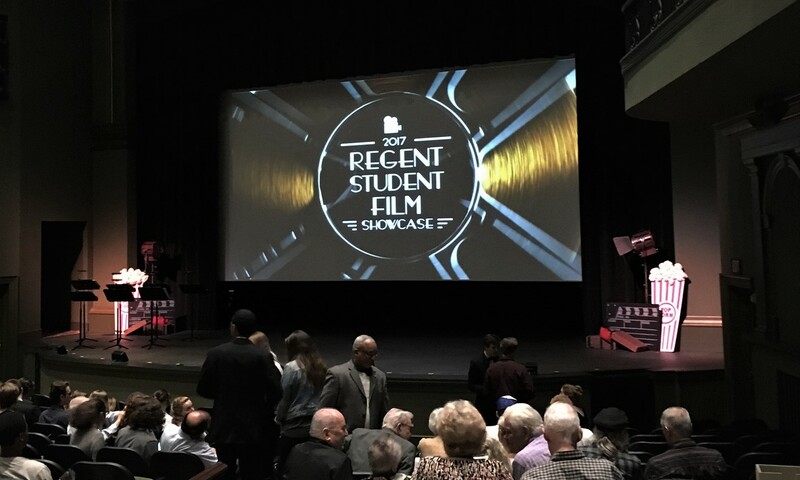 This event presented multiple short films directed, written, and produced by many of Regent’s talented students. The hard work was evident in every piece screened during the evening The films impressed the audience with a dash of humor, stunning visuals, and moving messages. Redemption was the theme for this year’s showcase. Elizabeth Corey, one of the event’s Associate Producers, commented, “Every showcase looks for particular things. We are a Christian university, so we focus on redemptive films. It’s what we do best.” From the hope of life after death to the constant need for forgiveness, this thread was beautifully woven through the films presented. Though most didn’t even mention God, the filmmakers carefully crafted stories that pointed towards a Christian worldview. While the directors usually get all the attention, there were names that appeared over and over throughout the night. One of these was Edward Digges, the winner of the Servant Leader Award. Besides submitting three short films himself, he also filled various roles in multiple other productions. Digges expressed his gratitude for the different experiences as each one helped him grow as an artist. “I’ve learned that you can’t do every single position yourself. I’m a bit of a perfectionist,” Digges admitted, “but you have to trust other people and their talents.” Freshman Harrison Dove-Green helped as a gaffer on the set of “Changing Jane.” As his first set, the experience helped him build a greater understanding of the filmmaking process. “It was very humbling to watch people’s work finally come to fruition,” commented Dove-Green. Collaboration is key in the film business. At Regent, our department simulates this reality, as students are constantly working together on productions. Senior Jordan Work, director of “Regent Rex,” explained that getting involved on sets not only helps you understand what you want to do in filmmaking but provides a great opportunity to network. “I am pursuing directing,” he commented, “but also love other roles in the lighting and camera departments. I found that out by getting on other people’s sets freshman and sophomore years.” As a soon-to-be graduate, Work feels that these relationships have given him connections and a kickstart in his future career. Nice coverage, Sara. Great article.